Kra-Z Hair Gro Fertilizer Nourishing Spritzer was brought to my attention by one of the ladies participating in the Protective Style Challenge 2016 a few days ago. I’ve been carrying out some research since then and this product looks very interesting. 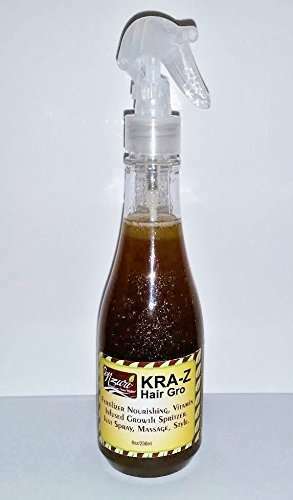 Kra-Z Hair Gro Fertilizer Nourishing Spritzer is produced by Nzuri Hair Care & Wellness, a family owned business located in Texas, USA. Help hair recover from thin edges, alopecia, shedding, breakage, weak and brittle strands. It also works as a deep conditioner. 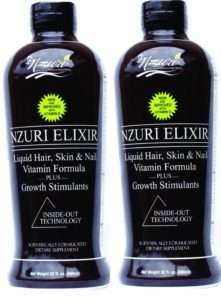 I went digging for the ingredients – distilled water, Nzuri elixir hair vitamins & hair follicle food 61 growth oil. 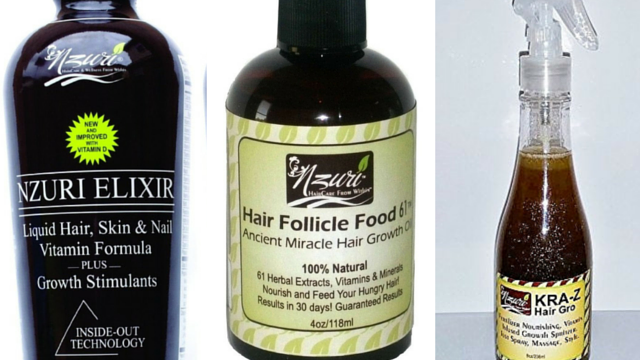 Both the elixir hair vitamins and food 61 growth oil are separate products from Nzuri so let’s look at the components of each one. The elixir hair vitamins is a liquid created to be ingested with food and contains vitamins A, C, D, E, B6, B12, thiamine, riboflavin, niacin, folate, biotin, panthothenic acid, iodine, zinc, selenium, copper, potassium and grape seed. It also contains a proprietary blend of aloe vera leaf, grape juice concentrate, green tea leaf extract, hyaluronic acid, inositol, DMAE bitartrate, resveratrol, calcium pyruvate, flaxseed, PABA, choline bitartrate, horsetail (aerial parts), silica, pine bark extract, alpha lipoic acid, melon pulp and borage seed. You can also use this product on your face. The hair follicle food 61 growth oil is a natural growth oil containing eclipta alba, neem, amla, rosemary, sesamum indicum, tea tree, henna, eucalyptus globules, lemongrass, sweet peppermint, basil, olea europaea, prunus amygdalus dulcis, simmondsia chinensis, mentha piperita, centella asiatica of, camellia cinensis, of aloevera, kapoor kachari, cinnamomum and camphor. All the ingredients above are mostly natural and contribute significantly in alleviating hair growth issues. A combination of both products in a distilled water infusion suggests a very powerful hair growth tonic. I will definitely be giving this product a try once it’s available my side of the pond and come back with a review afterwards. Unless you’re specifically allergic to any of the ingredients mentioned above, I would say go ahead and give this a try if your wallet agrees with you, especially if you have hair loss issues. You can patch test a small section of your head for a few hours before you apply the entire product all over. Do let us know if you’ve given it a try in the comments section.